There was yet another early goal here in Game 4 and it came from defenseman Guy Lapointe as he started off his stellar night with a goal just 46 seconds in, his 10th of the tournament. The top-seeded ’76-’77 Montreal Canadiens then got a PP opportunity five minutes later after Tim Kerr of the 12th-seeded ’84-’85 Philadelphia Flyers was called for elbowing. Steve Shutt capitalized on the PP just about 40 seconds into said PP with his 16th goal of the tournament. Lapointe registered his second point of the night with a secondary helper on Shutt’s goal. About 30 seconds later, Philly responded with a goal of their own to cut the lead in half as defenseman Mark Howe slammed home a Ken Dryden rebound off of a shot from Rick Tocchet. It was Howe’s sixth goal and Tocchet’s fourth assist. Late in the period, the Flyers got a long PP after Montreal’s defenseman Pierre Bouchard was given a double-minor for high-sticking. The Flyers were not able to capitalize on that PP before the end of the first period, but they were able to score before the end of the first minor. Tocchet scored just 50 seconds into the second period, his fourth goal of the tournament, which left a full two minutes remaining for their PP to give them their first lead of the game. However, Montreal was able to kill of that second minor and shortly after doing so, Yvon Lambert scored his fifth of the tournament to give the Habs a 3-2 lead. Kerr responded fairly quickly for Philadelphia with his 15th of the tournament almost three minutes later to tie it back up. However, Lambert responded with his second of the game two plus minutes later as the Habs took the lead again. 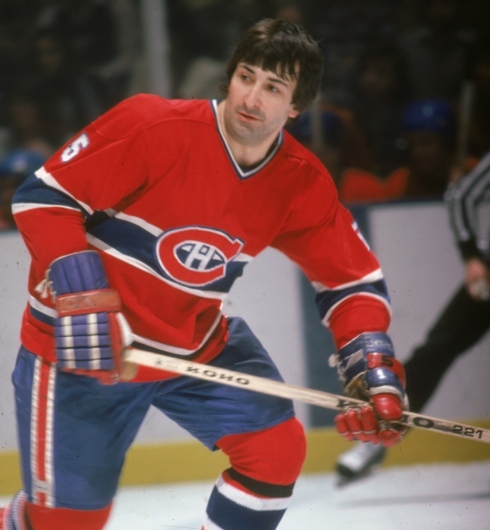 The Canadiens then scored a back breaker with a little over a minute left in the period as Mario Tremblay tallied his fourth. Philadelphia chose to pull starting goalie Pelle Lindbergh, again, after Tremblay’s goal, but the Flyers never got back in this one. Montreal added one more goal in the third period, but by that point their ticket had pretty much been punched for the Ultimate NHL Final. To nobody’s surprise the top-seeded ’76-’77 Habs are heading to the Ultimate NHL Final, again. The Canadiens franchise will go for their third UNP Cup. Tomorrow night, in the other semifinal, the 6th-seeded ’82-’83 Edmonton Oilers, who dropped Game 3, will look to rebound and take a 3-1 series lead over the 15th-seeded ’95-’96 Colorado Avalanche. This entry was posted in Semifinal, Ultimate NHL Playoff and tagged Guy Lapointe, Ken Dryden, Larry Robinson, Mario Tremblay, Mark Howe, Montreal Canadiens, Pelle Lindbergh, Philadelphia Flyers, Pierre Bouchard, Rick Tocchet, Semifinal, Steve Shutt, Tim Kerr, Ultimate NHL Playoff, Yvon Lambert. Bookmark the permalink.